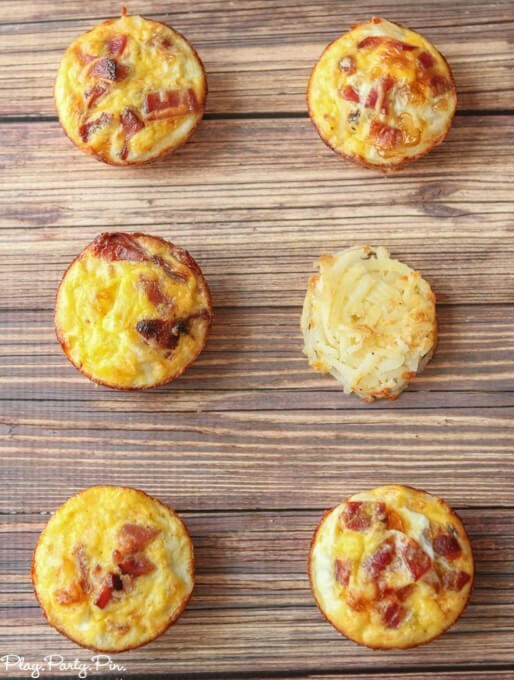 If you like an all-american breakfast of eggs, bacon, and hash browns, then you’re going to love these easy egg breakfast muffins with a hash brown crust! 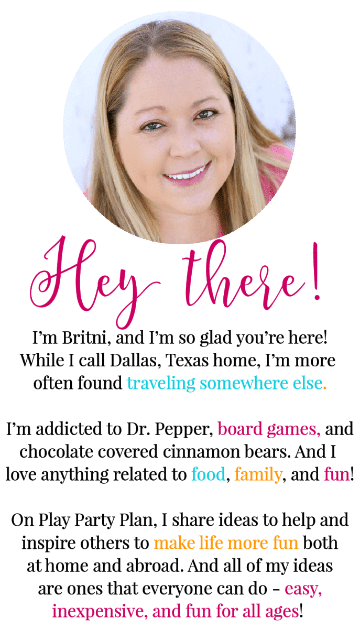 They’re great for a quick breakfast or to feed a large group at brunch! And simple enough that you can make them ahead and eat them all week long! I’ll be honest, I hate making breakfast. I love eating breakfast, but I hate making it. It just seems like it gets in the way of starting your day. I’d much rather sleep in for a few more minutes and have a breakfast I can just pop in the microwave and eat on my way to doing bigger and better things. 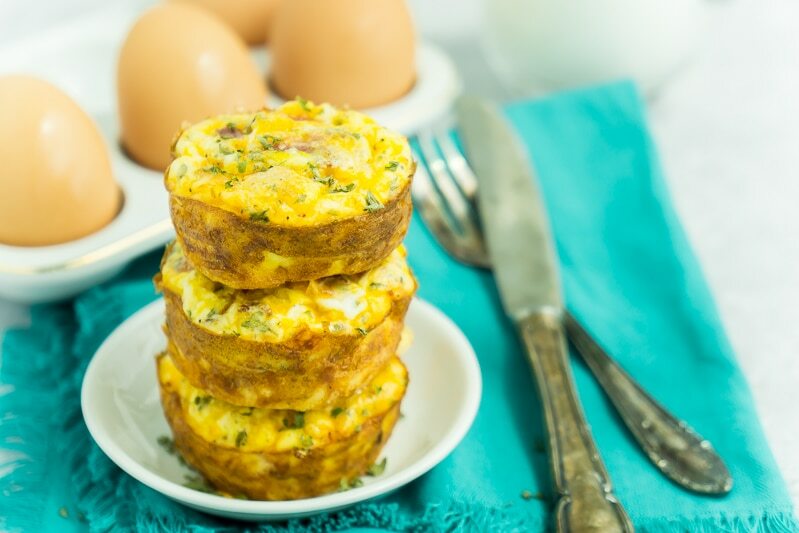 These breakfast egg muffins are just that. Make them once on Sunday and eat them all week long. And they’re good enough that I don’t even get sick of eating them, which seems to happen with food for me a lot when I eat it over and over again. They’re also one of my go-to recipes anytime I’m hosting a brunch. And a baby shower and let’s be realistic, anytime I can get away with making them. 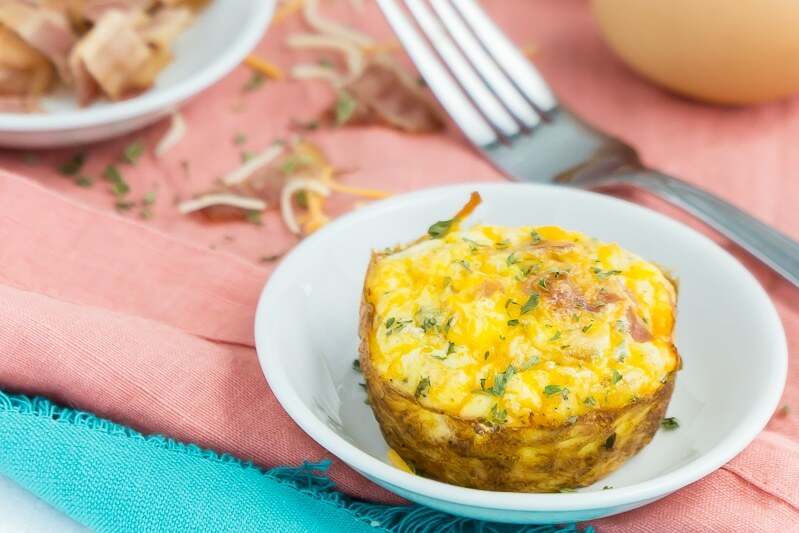 Because who wouldn’t love hash brown muffin cups for breakfast! I told you these are really simple to make, and I promise it’s true! Get all of your ingredients together first. I can’t even begin to tell you how many times I’ve gotten 3/4 of the way through a recipe only to realize I’m missing a key ingredient, one of the only ones you can’t find a substitute for. I used Simply Potatoes hash brown potatoes in my recipe, but you could really use any as long as they’re fresh and not frozen. 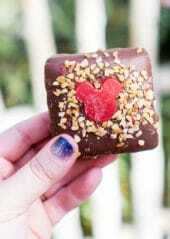 If they’re frozen, just make sure to thaw and strain them first or the mixture will be too wet. 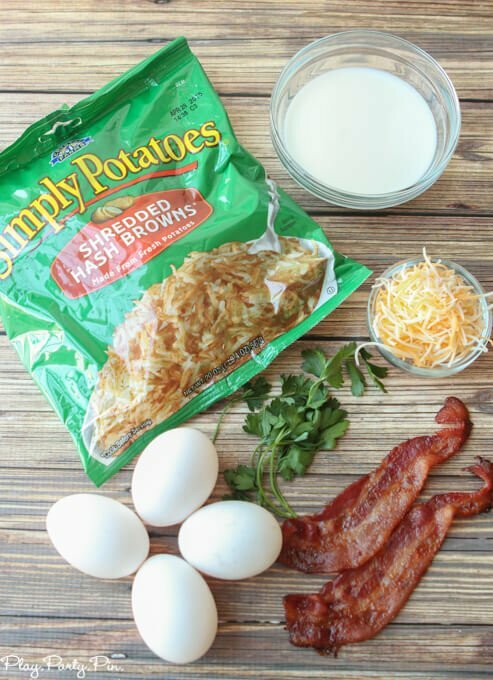 Once you have all of your ingredients, make your hash brown potato mixture. This will be your crust. 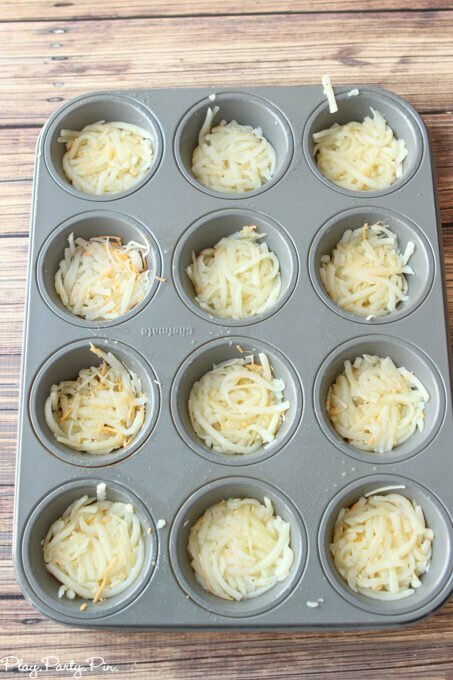 Spray a muffin tin with a non-stick baking spray then press the potato mixture into the bottom of the muffin tip cups to form a hash brown crust. Pop those babies in the oven for a few minutes to let them crisp up slightly. While the hash brown crust is baking, mix up your egg mixture. After the hash browns have cooked for a few minutes, top with the egg mixture and cook again. You can just cook it all together once, but the bottom won’t get as crispy. Cook until the egg is throughly cooked and puffs up like so. 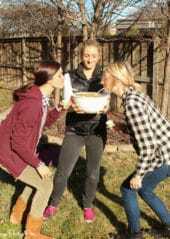 And that’s it, the perfect individual sized brunch casserole to impress your guests at baby showers, bridal showers, or whatever occasion you may eat brunch at. Or breakfast. Or dinner if breakfast for dinner is your kind of thing. It’s not mine unless waffles with ice cream are involved and then I’m all in. You can watch the video below to see how quick they’re made! 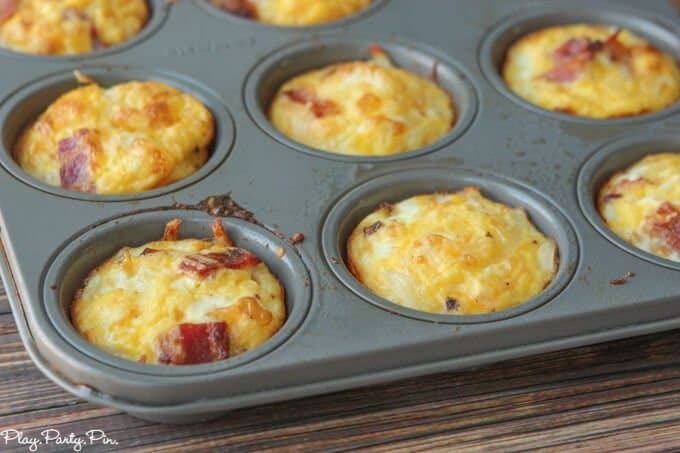 Delicious egg and bacon breakfast muffins with a hash brown crust. 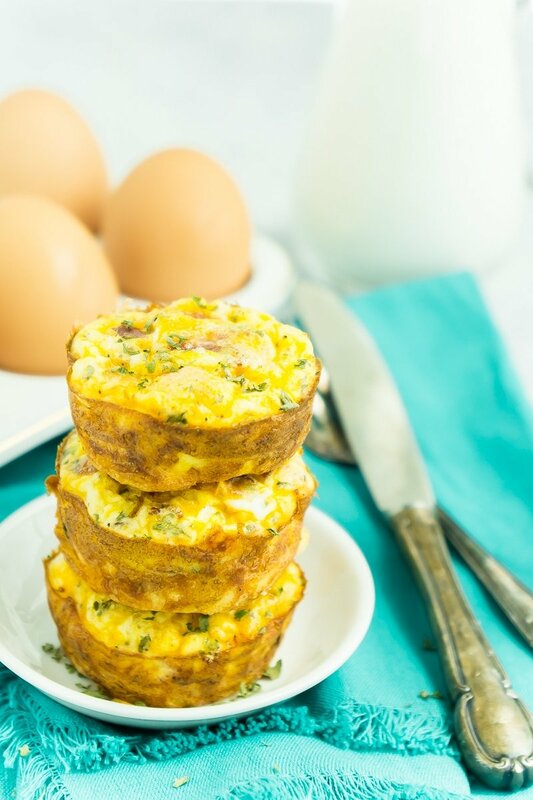 Perfect make ahead breakfast or for a brunch! Spray two 12 cup muffin tins with non-stick baking spray. Mix entire bag of hash browns with egg, oil, cheese, salt, pepper, minced garlic, paprika, and parsley in large bowl until seasonings are well combined. Split hash brown mixture evenly among the 24 baking cups then pat it down with the back of a cup or other round container that fits into the muffin tins. Bake hash brown crust in the preheated oven for 10-15 minutes or until it gets slightly browned and crispy. While crust is cooking, mix eggs, milk, cheese, salt, pepper, parsley, and bacon in a large bowl. 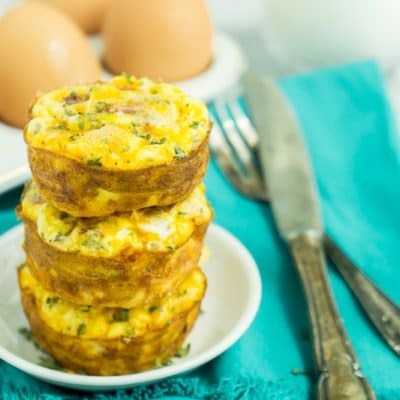 Once hash brown crust is slightly browned, split the egg mixture evenly on top of the hash browns in the muffin tins, filling to about 3/4 full. 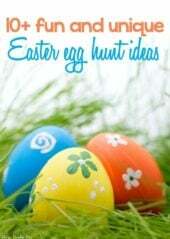 Bake in the oven for another 10-15 minutes or until eggs are fully cooked. Remove from oven and let cool for a few minutes before removing from the muffin tins by sliding a silicone spatula around the outside of the cups. Don’t forget to pin these breakfast muffins for later! Made these last weekend. I didn’t use a muffin tin, used a sheet pan and sausage because it’s what I had, used jack and cheddar again it’s what I had. They turned out delicious. After it was cool I cut up into 12 squares, packaged individually, froze half. Family loved them!